Biologically, cyanobacteria are the only photosynthetic prokaryotes (unicellular organisms without nucleus and mitochondria) that have the ability to produce oxygen. And interestingly enough, these photosynthetic micro-organisms have been existing on Earth for billions of years, and are considered as one of the driving forces behind the oxygen-rich environment of our planet. And now, scientists are looking forth to take the advantage of cyanobacteria’s ‘productivity’ in the realm of electricity. To that end, a collaborative effort from Imperial College London, the University of Cambridge and Central Saint Martins, has successfully demonstrated how cyanobacteria can perform its photosynthesis that led to the harvesting of tiny bits of electricity. 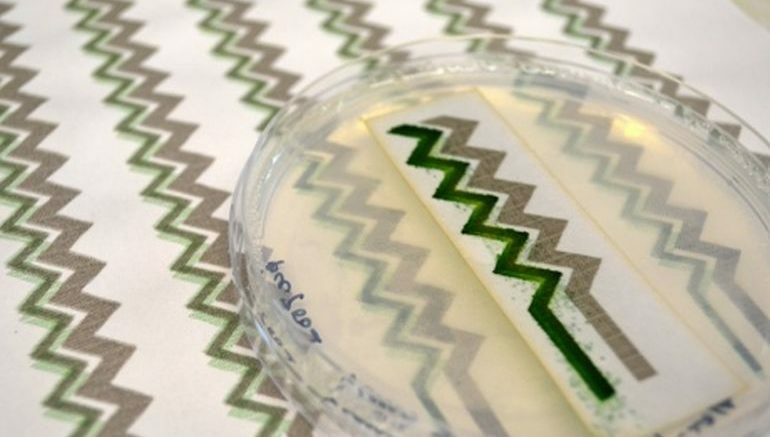 The first step to this fascinating feat entailed the usage of cyanobacteria in its ink form, which was printed (from an inkjet printer) onto electrically conductive carbon nanotubes. These nanotubes, in turn, were also printed on a piece of paper, essentially amounting to a rough panel. And after the conclusion of the experiment, the researchers observed that the cyanobacteria not only survived the procedure but also fueled photosynthesis that aided in the harvesting of small magnitudes of electrical energy, over a significantly long period of 100 hours. We think our technology could have a range of applications such as acting as a sensor in the environment. Imagine a paper-based, disposable environmental sensor disguised as wallpaper, which could monitor air quality in the home. When it has done its job it could be removed and left to biodegrade in the garden without any impact on the environment. Now the technology in question here pertains to a new type of renewable energy produced by microbial biophotoltaics (BPV). In essence, the process entails taking advantage of the biological competence of cyanobacteria and other algae that use photosynthesis to convert light energy into an electrical current, fueled by water as a source of electrons. Interestingly enough, BPVs also have the potential to harvest energy in the dark from the ‘reserve’ molecules that were previously produced by using light. On the other side of practicality, the BPVs are also limited in their capacity by a number of factors, namely how they are generally not cost-effective in the long run with low energy output and higher manufacturing expenses. Also, being based on living biological elements, such mechanisms tend to have shorter lifespans. Paper-based BPVs are not meant to replace conventional solar cell technology for large-scale power production, but instead, could be used to construct power supplies that are both disposable and biodegradable. Their low power output means they are more suited to devices and applications that require a small and finite amount of energy, such as environmental sensing and biosensors. 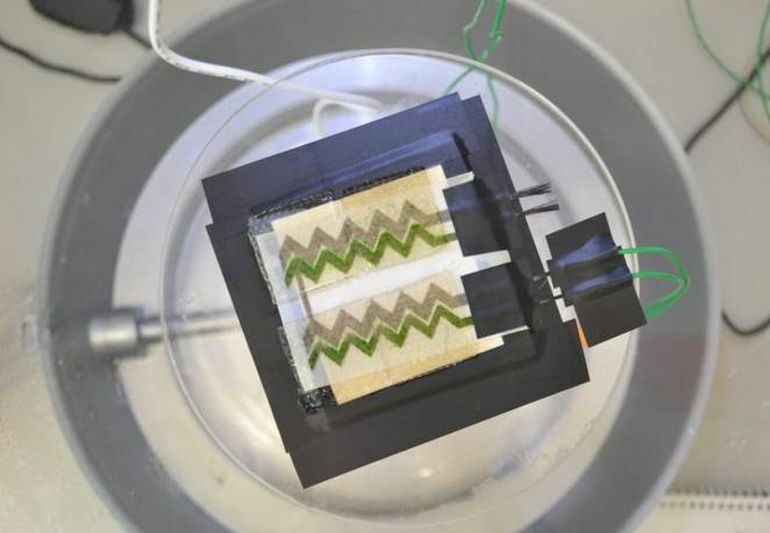 Paper-based BPVs integrated with printed electronics and biosensor technology could usher in an age of disposable paper-based sensors that monitor health indicators such as blood glucose levels in patients with diabetes. Once a measurement is taken, the device could be easily disposed of with low environmental impact and its ease of use could facilitate its direct employment by the patients. Furthermore, this approach has the potential to be very cost-effective, which could also pave the way for its use in developing countries with limited healthcare budgets and strains on resources.